Have a major in mind but want to talk to a professional in that field before making a final decision? 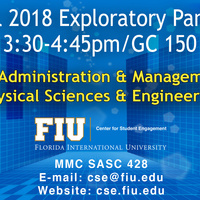 Come out this Thursday, November 15th from 3:30 pm to 4:45 pm in GC 150 to speak with professionals who majored in the Administration & Management and Physical Sciences & Engineering exploratory tracks. We hope to see you there!